About a week ago my dishwasher just stopped mid wash. The display went black and the buttons didn't respond. I was able to get into service mode, there was no error light lit up. I exited out and it seemed to be run through a cycle fine after that. The next time I ran it it did it again. Blank display non responsive buttons. I pulled the kick plate and looked for any leaking water and it appears dry everywhere that I can see. I entered service mode again and ran it through some tests. After running through all the tests I reran them again. Now I'm getting issues. Heater - I heard a couple clicks and it goes blank again. I dropped the control board down and it's blinking 7 times indicating the CSM is tripped. Drain pump - failed. CSM tripped again. While still testing the drain pump I opened the door and plugged the pump back in and closed the door. Pump kicks on fine and drains the dishwasher. Next I unplugged the heater from the board and try to test. The board blinks 4 times like the door is open, but does not fail. I plugged it back in and retested it and it failed. Then I checked the continuity of the heating element from the plug. Getting 16 ohms. Should be ok right? Then I refilled with water and retested the drain pump and it failed again. I'm at a loss for what else to check. Every time it failed it was a CSM error on the board and it was randomly related to the heater or the drain pump. Is it the main board that needs replaced? Found this post so take it for what it is worth! These are two different Technicians posting to each other. (Tech 1) 7 flashes on light is the current sense module., Something is reading to ground. 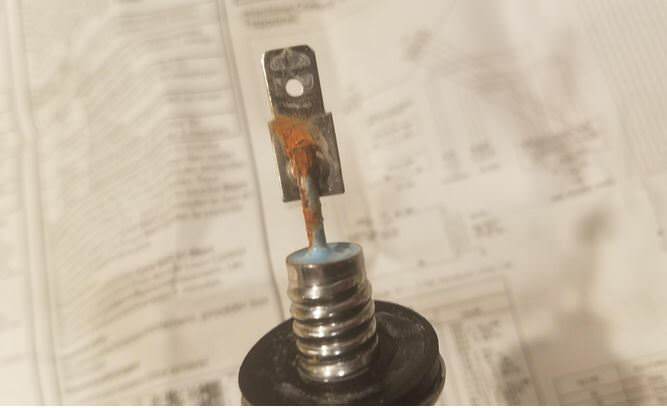 GE had a snag of bad heating elements. I can never get a reading to ground but replacing element fixed every one with the 7 flashes. (Tech 2) I was in GE training they told us replace board and heating element, only way to check heater ground fault with meager if ever buy would go with fluke 1800 series with maximum 1000 vdc. GDT580SMF7ES Also think this is your correct model number. Maybe I'll try the changing the heating element first. Well I'm back again. It made it 6 months running just fine, but now it's not heating again. I checked the heating element and it's showing about 16 ohms and still looks good. Then I tried to check for power going to the element. I then put it in test mode, set it to heat and tested from one element prong to the other and got 0V. Next I checked the thermostat and got 0 ohms, should be OK. Next I tried again by unplugging the element from the board and testing from the pins on the board and again got 0V. Is it safe to say the board is toast? No! We see lots of those with no heat. Always a bad flood sensor... WD21X10519. It wont even work in test mode if that sensor in the flood switch is bad. no way to test the sensor that I know of, but I would change it first. Every one of those I have seen with no heat and a good element has been the flood switch. OK, good to know. If the flood sensor is bad will it still allow you to fill water in test mode? Yes. The flood sensor has two purposes. It measures the level of the water and it also has a temperature sensor in it. Let us know how you made out with this repair. Will do. The part should be here today. Hopefully I'll have time to put it in before I have to go to work. I managed to install it and run it through the test mode. Like magic it makes heat again. I'll try running it througha full cycle tomorrow. Many thanks to schleven for saving me a bunch of time and money. I would have replaced the board and been pretty frustrated when it didn't fix it. I've run it several more times and everything is working as it should. Holy crap... you may have just solved a problem I spent 2 hours on today after replacing pcb thinking it had a bad relay. Didn't know that a bad thermistor would stop test mode from energizing the element.